DC’s newest pop-up imprint is readying its Deathblow. 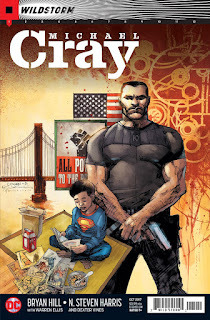 Since his return to comics earlier this year in Warren Ellis and Jon Davis-Hunt’s masterful THE WILD STORM, Michael Cray has been a man without a mission. After failing in his attempt to assassinate HALO mastermind Jacob Marlowe and igniting an international incident in the process, things for the hired gun took a turn for the worse when he discovered that he also had a brain tumor that would most likely take his life. When last we saw Cray, he had been forced out of International Operations, the secret organization that runs the world, when he was approached by Christine Trelane with an offer to join her rival organization. To learn what happens next, fans will have to look to future issues of The Wild Storm along with Cray’s new solo spinoff, which will be landing in stores this fall. Warren Ellis’ critically acclaimed relaunch of WildStorm gets its first solo spinoff series! Michael Cray, professional assassin, has been betrayed by International Operations and has an alien life-form in his head that’s either killing him, transforming him, or both. The only thing that can bring sense to his life is for him to do what he does best: kill the wrong people for the right reasons. But Michael needs support and resources to hit back against I.O., and he gets them in exchange for working with Trelane, taking out her targets, his way. First up? A sociopathic silicon-valley billionaire by the name of Oliver Queen! Oliver Queen?!? Is the WildStorm imprint about to cross over into the DCU? And it sounds like there’s a lot more to that brain tumor of Cray’s than we realized. Look for the first issue of Wildstorm: Michael Cray on October 11, 2017.